In order to elevate Utah business, leaders in both the private and public sector said the state’s focus needs to be on planning for the future, at the 12th annual Utah Economic Summit on Friday in Salt Lake City. To adequately plan for Utah’s economic future, two major themes summit presenters looked at are business growth and skills education. “Utah has the most diversified economy in the nation,” said Natalie Gochnour, director of the Kem C. Gardner Policy Institute, in her Friday morning presentation looking at Utah’s economic trends. While 2018 will continue to be a very strong year economically, Gochnour cautioned that she foresees slower business growth for the state in 2019. Utah’s economy peaked in 2015, she said, and there are signs of decreased growth — including rising costs across all sectors. She cautioned business decision-makers to “stop, look and listen,” and carefully monitor their economic decisions over this next phase. Gov. Gary R. Herbert set the tone for the state’s look at business growth by speaking more broadly about Utah’s business beyond its own borders. He explained that his administration’s focus on remodeling the Salt Lake City International Airport and championing an inland port comes from this focus. He spoke out strongly in favor of free trade. He referred to the very different economies currently functioning in North Korea and South Korea — postulating that because North Korea economically chose to be isolationist in years past, their current economy and national gross domestic product are both extremely low. In contrast to that, South Korea “embraced freedom” and more open trade, Herbert said — thus, they are a thriving economy today. Herbert believes Utah and America can learn from this. He spoke out harshly against the tariffs and “protectionist” policies he sees going on in Washington, D.C. Using Utah’s international business success and his administration’s encouragement of it as an example, Herbert said globalization and international trade are essential to global economic growth. He said it is more important to build bridges in trade, and work collaboratively on expanding trade “rather than erecting walls or barriers.” He believes trade wars and allowing companies to retreat into their own silos is not good for business and economic growth anywhere. “Utah business already knows how to compete and how to win in the global marketplace. I would much rather place my bet on them and you than to gamble on tariffs and other protectionist measures,” he told the audience. Herbert put his words into writing Friday during a ceremonial signing of Utah Senate Bills 131, 103 and 104 and House Bill 437. These bills, passed by the Utah Legislature this year, deal with preparing for Utah’s economic future and workforce needs through education pathways. 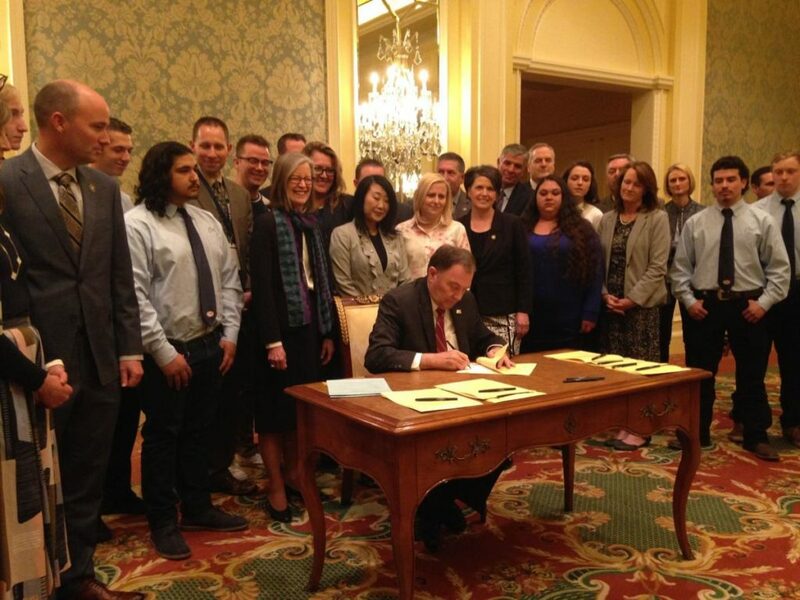 SB 131 adds a Talent Ready Utah Center within the Governor’s Office of Economic Development. SB 103 amends and strengthens workforce partnerships between the Legislature and technical colleges. SB 104 incentivizes students who pursue technical education, by forgiving a percentage of their educational loans as they work in economic growth-related careers within Utah. HB 437 set up scholarships for those who pursue specific degrees through career and technical institutions. Surrounded by the legislators who sponsored the bills, educational directors, technology students and tech sector advocates, Herbert said the bills represented joint planning and collaboration between business and education across the state. “This will allow more and more of our young people to have opportunities to get advanced education in the tech arena,” he said. Another aspect of planning for the future is the importance of mentorship and continuing sponsorship within a career. Sara Jones, CEO of Burbley and founder of the Women Tech Council, led a breakout session panel dealing with the importance of mentorship. Panelists encouraged others to have an abundance mindset, encouraging the next generation through its struggles to create economic and business success. Just as educational planning is a continual process, business leaders should not be afraid of long-term mentoring. Don Willie, director of the Emerging Leaders Initiative, said passing on knowledge and experience can’t be done just over lunch one day. It’s a process that takes time and trust between the mentor and mentee.